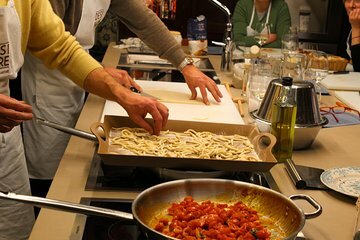 Tauchen Sie ein in die kulinarischen Traditionen von Perugia und lassen Sie sich in diesem 3-stündigen Hauskochkurs für kleine Gruppen in rustikale umbrische Küche eintauchen. Holen Sie sich Tipps und Techniken von einem lokalen Chefkoch. kreieren Sie traditionelle Rezepte wie Panzanella und Torta al testo; Anschließend genießen Sie ein leckeres hausgemachtes Mittag- oder Abendessen, begleitet von regionalen Weinen. The best part of the class was meeting Lucca's mom, who was a delight. The class itself was most certainly not as advertised. The description stated array of traditional dishes, local specialties ie Torta al Testo, Panzanella, region's culinary heritage, plenty of tips and techniques, selection of local wines to include red and white. As you can see from the photo this was it.... a bowl of pasta with a ragu we had to ask what it made from??!! We kneaded some dough, had a brucchutta, a small glass of wine and a dessert. No discussions of the region, the recipe, the wine etc. All this while, in between personal calls, Lucca was acting as translator. Additionally, the afternoon before the class we received an email informing us that the address and time had been changed. When we asked for instructions to the home we were told... take a taxi. When we arrived at the Perugia train station even the cab driver wasn't sure how to get to the place. Twenty-five minutes and 20 euro later we arrived. The class was disorganized and unclear.. we were told to use our phones to take notes... Then.. at the end, when we were still sitting down, Lucca hopped up and announced.. well.. I gotta go. My partner and I looked at each other then immediately asked if we could get a ride back to the train. As stated... the mother was absolutely a delight.. the rest... for 160 euro including the taxi you could have several amazing dinners, replete with regional experiences, for that price.